Two top environmentalists from Gujarat have revealed that a recent joint visit of Gujarat Pollution Control Board (GPCB) and Central Pollution Control Board (CPCB) officials in Vadodara’s industrial region has found the chemical oxygen demand (COD) of 890 to 1,022 mg per litre of water in channels which are supposed to carry treated, against the maximum norm of 250 mg per litre. Chemical oxygen demand (COD) test is used as a useful measure the amount of organic pollutants in surface water, including wastewater to ascertain of the water quality. It is expressed in milligrams per liter (mg per litre), which indicates the mass of oxygen consumed per liter of solution. Asking Government of India to declare chemical emergency for ECP industrial cluster of Vadodara district, even as cancelling consolidated consent and authorization of the Vadodara Envior Channel Limited, responsible for ECP, the environmentalists have also sought cancellation of environment clearance of all the defaulting polluting industries of the ECP industrial cluster of Vadodara District. In a letter to the secretary, Ministry of Environment, Forests and Climate Change, Government of India, the environmentalists have said, the ECP channel passes through 24 villages and prime agricultural land, which is known as the vegetable basket of Gujarat. 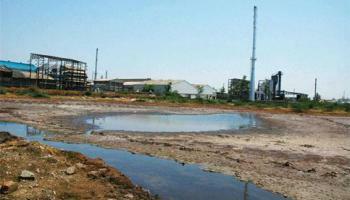 Commissioned in 1983 to carry treated industrial effluent from industries near Vadodara to estuary of River Mahi, Gulf of Khambhat, the environmentalists say, the channel carries the effluent of Nandesari Industrial Estate and Vadodara Industrial Complex, apart from a number of polluting industries started coming up on along both side of ECP. Pointing out that there have been several investigations conducted by CPCB and GPCB, and other agencies appointed by the concerned authorities, they say, the latest in the series of indictments is “Ground Water Pollution In Luna, Dudhawada, Piludara Area Near Vadodara, Gujarat”, released in July 2016, which followed “Report On Effluent Conveyance System for Nandesari Industrial Area And Industries Located Near Vadodara, Gujarat” of February 2010.